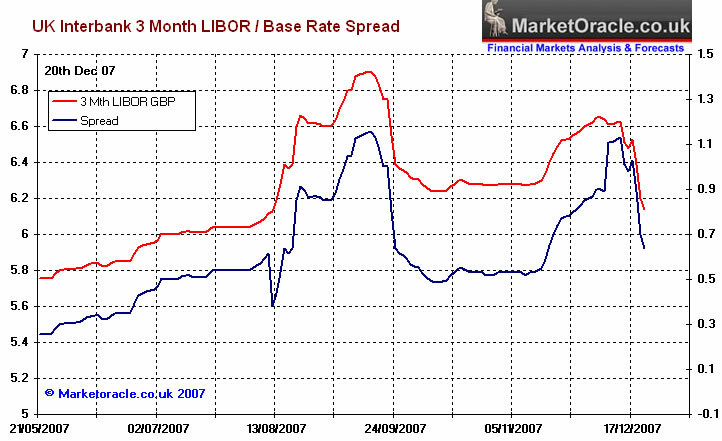 However despite the sharp 0.5% drop in the 3 month LIBOR rate from 6.63% on the 12th of December to 6.14% today, the spread between the LIBOR rate and the base rate still stands at an elevated 0.64%. Whilst during a rate cutting cycle the expectations are for a neutral or even negative spread to the base rate. Therefore this clearly indicates that the banks are still reluctant to lend to one another and therefore the credit freeze remains intact. It is expected that central bank intervention will continue to drive the spread lower towards 0.5% and therefore further easing in the LIBOR rate over the coming days is anticipated towards a target of 6%.